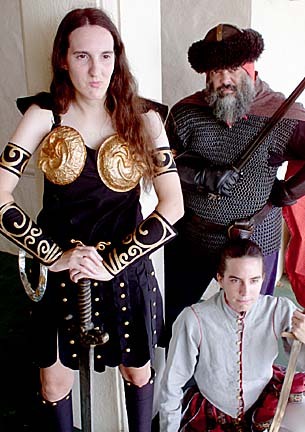 > Xenites -- clockwise from left, Gypsy Madden as Xena, Milton Ragsdale as Vlad and Jennifer Beard as Costanca -- prepare for the Xenafest. Fans of the syndicated TV series "Xena: Warrior Princess" know irony. After all, the show was an exercise in campy cleverness and featured more tongue-in-cheek writing than, say ... well ... "Star Trek." And, like "Star Trek" again, it struck a hugely resonant chord within a segment of the population. "Xena" wasn't just a TV show, it was a window into a more vibrant world. So it's somewhat ironic that it was the Internet, known for safe anonymity, that brought "Xena" fans face to face. "The fans are called Xenites, actually -- pronounced 'zee-knights,'" explains Jackie Young, Xenites Hawaii Club Coordinator. "When the show came out in the 1990s, it paralleled the rising use of the Internet, and we used to chat online about the show. The idea came along of having a little fan get-together, and it really was little at first. 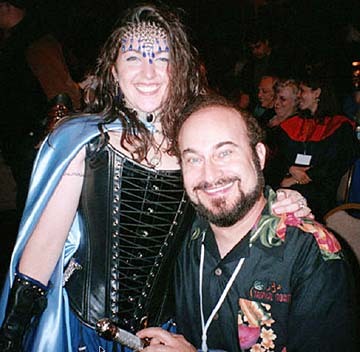 The first Hawaii Xenafest was me and a girl from Maui!" This weekend, the "7th-Ever Xenafest" takes place 11 a.m. to 3 p.m. Sunday in Room 110 at the University of Hawaii-Manoa Institute of Geophysics, but Young notes, "Come early and stay all day!" Expect autographs, martial arts demonstrations, auctions, costume and battle-cry and trivia contests, music and interview videos, food and door prizes, and -- get this -- a guest star! Journeyman character actor Robert Trebor (you may remember him as slippery Salmoneus on dozens of episodes of both "Xena" and "Hercules"). Fans get to meet their stars at various Xena events around the country. Robert Trebor, who played the slippery Salmoneus, will be on hand at Sunday's event. Sounds like a swell time for Xenites or anyone leaning toward Xenitery. Conventions like this are mostly networking festivals, connecting folks of similar interests and passions. They are empowering for fans, who get to meet the people who understand them. Overpowering identification with TV characters is a 20th-century phenomenon little understood by social psychologists. These characters are, after all, beamed directly into your home and your imagination, and enter your subconscious, operating in a fictional world of both heightened reality and lowered expectations. If only our complicated, real world could be handled by swinging a sword. No, in our world the dragons are endangered species, that hideous troll is your boss and evil wizards are running for governor. By now, the non-Xenites who have read to this point are spiking on the Huh? meter. What's a Xena? ONCE UPON A TIME, about a decade ago, some bright guy decided that independently produced TV shows featuring mythological characters would be an easy sell to the emerging cable and Third World television networks. By setting the shows long ago and far away, they wouldn't be dated, like "Miami Vice," or be impossible for non-Americans to understand, like "Miami Vice." American muscleboy Kevin Sorbo was cast as Greek muscleboy Hercules in a show of the same name, filmed and produced by Australian and New Zealand crews in the pastoral prettiness of New South Wales and other non-Hollywood locations. A character introduced on some of the Hercules episodes sent up skyrockets of self-recognition among female viewers. Xena, a "warrior princess," was strong, saucy, self-reliant and -- as played by 6-foot babe extraordinaire Lucy Lawless with a wink and a horse laugh -- just plain cool. Xena was paired not with some male hunk, but with another woman. Gasp! Gabrielle (not a very ancient-Greek name, hey?) is as sunny and blonde as Xena is dark and tense, as friendly and open as Xena is brooding and withdrawn. Gabrielle dreams while Xena has nightmares. Gabrielle is played by coquettish Renee O'Conner as a kind of cheerleader still on the learning curve into adulthood. The chemistry between the two women is perfect and awesome, a closed circle. (Xena's weapon of choice, by the way, is a discus, a flying hole, the opposite of the phallic broadsword.) The best scripts skipped the monsters and battles and dealt exclusively with Xena and Gabrielle's relationship. Women and -- ahem! -- sensitive men were transfixed. It helped that the show was fun and clever and imaginative, but the main thing was this loving relationship. Nothing like it had ever been seen on TV before, and certainly not without snickering. Here were two women in a stable, happy and adventurous life together. No men. Does mean that Xena and Gabrielle are, well, you know ... lesbyterians? One of the show's fans here in the office positively shrieks at the notion. "They are NOT! NOT! Xena and Gabrielle are JUST GOOD FRIENDS! You MEN! Is that all you THINK about? For God's SAKE!" Jackie Young chuckles. "Yeah, it's a chick show. I was one of the first to speculate online about the physical nature, the subtext, of their relationship. It was picked up and discussed to death, and still is. What the show did that was so clever is that they left it completely ambiguous. They made it so you could read whatever you wanted to into it. In most television, there's no ambiguity or depth like that, and little things like that make watching Xena a rich experience. "Beyond that, it was the first show that didn't rely on men to get the heroine out of sticky situations. She did it herself or with her female partner. Even shows where the star was a woman -- 'Bionic Woman,' 'Honey West,' 'The Girl from U.N.C.L.E.' -- there were men around to help her get the job done. Snore." Young also points out that "Xena" was "the first episodic TV show, as far as I could tell, to actually spoof the fans and to actually PLAY to fans' sensibilities. The producers, writers and actors were unusually accessible to the fans, usually via the Internet, but also in person at conventions. "And it was the first TV show, as far as I know, to allow a fan to actually write for the show. Two episodes from the sixth season were written by Missy Good. All these things made for an extremely interactive experience, which we've never had before with episodic TV, especially a drama." Back to the Internet, it seems. But you can meet other Xena fans live and large as life this weekend.